(NaturalNews) In the minds of many concerned parents, there is no more toxic, dangerous vaccine in the world than Gardasil. More children and teens have been maimed, hospitalized, injured and even paralyzed by HPV vaccines than any other category of vaccine interventions. And now, the American College of Pediatricians -- a strongly pro-vaccine group -- is sounding the alarm over the toxicity of Gardasil. 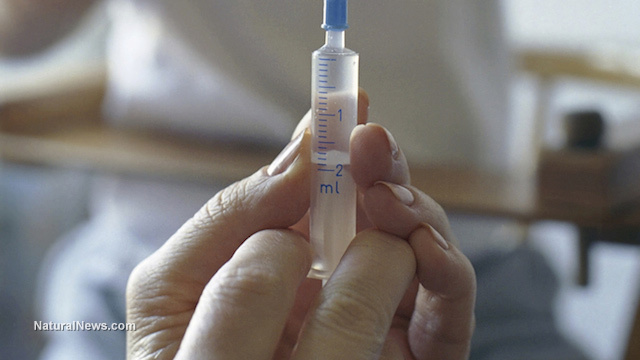 Gardail vaccines could be "associated with the very rare but serious condition of premature ovarian failure (POF)," says the ACP on its website. Furthermore, none of the junk science "safety" studies touted by the vaccine industry ever tracked post-vaccination outcomes regarding ovarian health. "[L]ong-term ovarian function was not assessed in either the original rat safety studies or in the human vaccine trials," explains the ACP. Even more, because doctors are so aggressively propagandized by the cash-rich vaccine industry, they don't even realize that HPV vaccines can cause ovarian failure. "Most primary care physicians are probably unaware of a possible association between HPV and POF and may not consider reporting POF cases or prolonged amenorrhea (missing menstrual periods) to the Vaccine Adverse Event Reporting System (VAERS)," says the ACP. One of the crimes against children that's carried out by the vaccine industry is the ongoing use of chemical adjuvants in vaccines. These toxic chemicals include aluminum, monosodium glutamate and polysorbate 80, and they are intentionally added to vaccines in a misguided effort to try to make the vaccines produce an inflammatory response in vaccine victims. But these same toxic chemicals may also cause, in some children, extreme neurological inflammatory responses that lead to precisely the kind of permanent damage that gets diagnosed as Autism Spectrum Disorder (among other neurological side effects). If society routinely injects poisons into children, we should not be surprised when some percentage of those children are damaged by those poisons. [P]otential mechanisms of action have been postulated based on autoimmune associations with the aluminum adjuvant used and previously documented ovarian toxicity in rats from another component, polysorbate 80. In other words, the science already knows about the mechanisms of potential harm caused by these ingredients. It's not a mystery, and it's not even debatable that injecting children with aluminum, mercury (i.e. flu shots in California), MSG, formaldehyde and polysorbate 80 will inevitably cause severe damage in some of those children. When I tested flu shots in my laboratory via ICP-MS instrumentation, I found them to contain 25,000 times more mercury than the legal limit of mercury in the water supply. If you're still not aware that all these ingredients continue to be used in vaccines in America, the CDC has already admitted they're all routinely used in vaccines. This is not some hypothesized conspiracy theory; it's an open admission by the CDC and the vaccine industry. According to the American College of Pediatricians, 88% of adverse event reports involving ovarian failure have been associated with just one vaccine: Gardasil. "[S]ince licensure of Gardasil in 2006, there have been about 213 VAERS reports (per the publicly available CDC WONDER VAERS database) involving amenorrhea, POF or premature menopause, 88% of which have been associated with Gardasil." Keep in mind that because doctors don't even realize Gardasil can cause ovarian failure, the vast majority of ovarian failure cases are never reported to the CDC VAERS database. It is feasible that the real number of ovarian failure cases caused by Gardasil might be up to 100 times the reported number, or as many as 20,000 cases across America in the last decade. As Natural News readers know very well, virtually every bit of "science" carried out by the vaccine industry is fraudulent science. Gardasil trials were no different: they put aluminum and polysorbate 80 into the placebo injections, making sure that both the placebo group and the treatment group experienced the same number of toxic side effects, thereby cancelling each other out. From this, fraudulent researchers can proclaim the clinical trials showed Gardasil to be "safe" while causing "no increase in adverse effects." "Pre-licensure safety trials for Gardasil used placebo that contained polysorbate 80 as well as aluminum adjuvant," says the ACP. And that's not an accident. It was done by design to conceal the harm caused by those ingredients. Note carefully that the vaccine industry never conducts legitimate science that compares, for example, the injected of aluminum and polysorbate 80 vs. injections of nothing but saline solution. If that trial were carried out, it would reveal the serious, long-term toxicity caused by aluminum and polysorbate 80 (not to mention mercury, MSG, formaldehyde and other toxic ingredients that are deliberately added to vaccines). "Therefore, if such ingredients could cause ovarian dysfunction, an increase in amenorrhea probably would not have been detected in the placebo controlled trials," explains the ACP. And they're correct. But the design of those trials wasn't an accident. The vaccine industry routinely and systematically designs its clinical trials to conceal the evidence of harm caused by vaccines. 1) According to CDC scientist and whistleblower Dr. William Thompson, the CDC knew over a decade ago that childhood vaccinations caused a significantly increased risk of autism in African-American boys. Dr. Thompson and other CDC scientists actively conspired to alter the study data in order to erase any such correlation. Two years ago, Dr. Thompson publicly admitted to taking part in this scientific fraud. The ENTIRE mainstream media -- without exception -- blackballed this story and refused to report it. No one in Congress ever called Dr. Thompson to testify about the CDC's vaccine fraud. 2) In 2010, two Merck virologists filed a False Claims Act with the United States government, asserting that they were ordered by Merck management to commit scientific fraud by spiking antibody samples with animal antibodies. This was done to defraud the FDA into thinking that MMR vaccines worked to prevent disease when, in reality, they utterly failed to work at all. Natural News has published that False Claims Act document at this link. Merck knowingly falsified its mumps vaccine test results to fabricate a "95% efficacy rate." • In order to do this, Merck spiked the blood test with animal antibodies in order to artificially inflate the appearance of immune system antibodies. • Merck then used the falsified trial results to swindle the U.S. government out of "hundreds of millions of dollars for a vaccine that does not provide adequate immunization." • Merck's vaccine fraud has actually contributed to the continuation of mumps across America, causing more children to become infected with mumps. • Merck used its false claims of "95 percent effectiveness" to monopolize the vaccine market and eliminate possible competitors. • The Merck vaccine fraud has been going on since the late 1990's, say the Merck virologists. • Testing of Merck's vaccine was never done against "real-world" mumps viruses in the wild. Instead, test results were simply falsified to achieve the desired outcome. • This entire fraud took place "with the knowledge, authority and approval of Merck's senior management." • Merck scientists "witnessed firsthand the improper testing and data falsification in which Merck engaged to artificially inflate the vaccine's efficacy findings," according to court documents (see below). Now, a full six years after the filing of this False Claims Act describing systematic vaccine fraud at Merck, there isn't a single mainstream media outlet that has bothered to honestly investigate this astonishing story -- not even during the staged measles outbreak pandemic that was set up to push for passage of the SB 277 vaccine mandate in California. That's because the vaccine industry, the CDC and the mainstream media are all deliberately pushing an epidemic of vaccine violence against children. That violence against children is not merely ignored but even condoned by the CDC, drug companies, doctors, hospitals, universities, media outlets and lawmakers. The systematic maiming of children has become the mantra of modern medicine, where countless children now suffer under a medical dictatorship that demands the sacrificial destruction of children in order to appease the profit gods of Big Pharma. There is not even a shred of legitimate science to be found in the vaccine industry. It is nothing but vaccine voodoo and medical mythology carried out by the Church of Medical Mysticism where all "evidence" is faked in order to support the faith-based beliefs of the devout followers who profit from harming children. Far from "evidence-based medicine," today's vaccine industry makes a mockery of science and obliterates any possibility that vaccine risks vs. possible rewards might be assessed through rationality and critical thinking. Instead, vaccines are pushed under a totalitarian demand of absolute, mindless obedience... a position that stands in utter contradiction to the very principles of scientific discovery. As children continue to be maimed and murdered with vaccine injections, the conspiracy of silence across every institution in America reveals what can only be called a modern-day medical holocaust. Yet those who are the most seriously injured by these vaccines are so damaged that they cannot speak for themselves anymore. Who will speak for them if not us? And if "science" is whatever we are told it is by health authorities -- but it cannot be questioned or challenged or even validated by independent scientists -- then it isn't really science at all, is it?